Camila and the brave Emma Gonzalez from Parkland are among many young women taking stands on issues that unify people across racial, gender, and political lin. This year we honored another Camila and her twin sister Carolina Bortoletto at our Peoples’ World Amistad Awards, who are two young dreamer women at the front of the immigrant rights fight in Connecticut. They have also marched with unions and black lives matter, and were part of our Black History Month celebration this past Sunday. High school immigrant youth, many of them young women, will be at the front of the 17-minute walkouts at their schools March 14th, in which 1600 schools have already pledged to participate. The recent “die-ins” and similar actions in response to the shooting in Florida are of course reminiscent of the hundreds of die-in actions organized by Black Lives Matter across the country. Alicia Garza, Patrisse Cullors, and Opal Tometi, three Black female activists with broad social justice experience, began the Black lives Matter movement in 2013 following the acquittal of George Zimmerman, Trayvon Martin’s killer. “Say Her Name” is a movement within the community of Black Lives Matter, declaring that activism around police brutality must include the narrative of black women, including queer and trans black women. Johnetta Elzie, at age 26, quickly became one of the most prominent voices in modern day civil rights when she began reporting and organizing around the killing of Michael Brown in her hometown of St. Louis, MO. She co-founded the organization “Mapping Police Violence”, which documents the killings of people by police. A Public Religion Research Institute youth survey shows that young women are more likely to follow/post about political issues online, sign an online petition, have an issue that they care about, attend a rally, and donate to a cause. However, young women are also more likely to say that insufficient information and fear of criticism inhibits their involvement in political issues. The Women’s March on Washington was likely the largest single-day demonstration in recorded U.S. history. 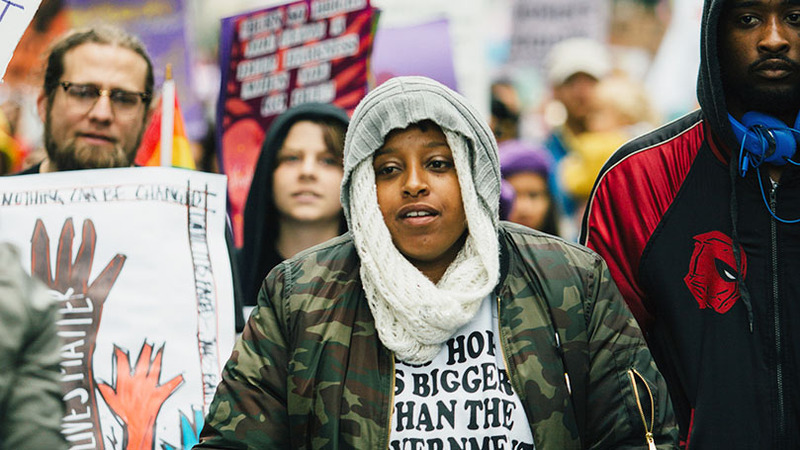 Young, queer, women of color were at the center of the planning and execution of the march, declaring that this is their movement, not just a white women’s movement. After all, white women sadly voted majority for Trump in the elections. The March 24th “March for our Lives” on Washington will be an opportunity to further unify women across all racial, class, and political lines in the fight against the extreme right and Trump’s sexist and violent agenda. It will also be a galvanizing moment for the fight ahead in 2018 to get the progressive movement to the polls.